This post originally appeared on the Alphametic Blog. Either way, it’s good to check out what others in the industry are saying about Local, Link-Building, Content marketing, PPC, and all the other disciplines across SEO. Alphametic has curated a list of Top 10 SEO Gurus for 2018 that will ensure you’re always up to date. When it comes to essential reading, anything written by this guru is a must. Barry Schwartz is the CEO of RustyBrick, a web service firm. He is also the executive editor of Search Engine Roundtable, an advanced SEO forum for all the search geeks out there. He’s always on top of the latest Google news and can be seen posting on twitter regularly about different algorithm updates or sharing some of the seemingly hundreds of articles he posts every day. Recent Post: Google Search Algorithm Shifts Around September 19th? Bill has been in the business since 1996. He’s truly a veteran of the space and has been writing about SEO for decades. He is the founder of SEO By the Sea, as well as an administrator of Cre8asite Forums, one of the best forums about internet marketing and search engine marketing. He regularly contributes articles to Search Engine Watch and Search Engine Land as an expert. If you need some help building links, Julie’s your go-to. Julie Joyce is the Founder of Link Fish, a link-building agency based out of North Carolina. She has been working in SEO since 2002 and is a co-founder of the SEO Chicks blog. Nowadays she’s a monthly columnist at Search Engine Land and Director of Operations at Link Fish Media. Recent Post: Why isn’t my fabulous content attracting quality links? “All local, all the time. What else is there?” Mike Blumenthal is all about Local SEO. He is a leading industry-expert in this space and is the Chief Review Officer of Gather Up, a business review site he founded with Don Campbell & Thomas Hasch. He runs the “Understanding Google Maps & Local Search” blog and is constantly shedding new light into the Local SEO world. He has over 30 years working with computers and in the internet space. Recent Post: What Percentage Of Verified Businesses Use Google Posts? No guru list would be complete without Neil Patel. With a blog that generates over 2 million users per month, it’s not hard to see why. He is a leading industry-expert in everything digital marketing. SEO, content, PPC, social and more. He is the Co-founder of KISSmetrics, Quicksprout, Crazy Egg and Neil Patel Digital. Tim Soulo is the head of marketing and product strategy at Ahrefs, you know, that tool every single SEO uses? He consistently publishes research studies on the Ahrefs blog about keyword research, backlinking, and other studies with titles like “What we learned about’Long Tail’ by analyzing 1.4 billion keywords”. He speaks at SEO conferences, podcasts and runs the Ahrefs Youtube channel. As is evidenced by his company name, Backlinko, Brian Dean is an SEO-driven backlink guru. He’s become known for publishing high-quality blog content that is incredibly well-researched, data-driven and practical. He’s worked with companies such as Disney, IBM, Amazon and more, as well as multiple founded many online sites. Aleyda has positioned herself in the vital space of International SEO. 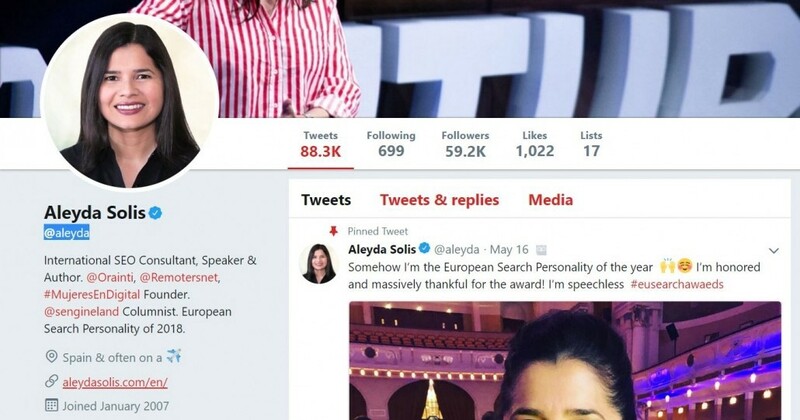 Aleyda Solis recently won the 2018 European Search Personality of the Year award and has been featured in the Huffington Post, as well as the Google Partner’s Podcast. She consistently puts out blog content and speaks at conferences all around the world sharing her experience and expert advice on global search marketing. Moz in itself is an authority on SEO, but Dr. Pete Myers brings the data to the table. He’s got a PH.D in Cognitive Psychology, so he knows his way around statistics. He is regularly publishing research studies with topics like: “New Research: 35% of Competitive Local Keywords Have Local Pack Ads” and the like. If you want a data-driven perspective to a new Google algorithm or a recommendation based on quantitative studies — he’s your guy. Good old Jim — he’s been around since 1999 spreading his internet marketing knowledge. He is the founder and CEO of Internet Marketing Ninjas based in New York. He’s been featured in Forbes, the Examiner and has been recognized as a Top 40 Leader Under 40 by the Business Review. He specializes in Link Building, SEO, Blogging, Social Media Marketing and pretty much every other internet marketing specialization. Recent Post: The Google Featured Snippet Optimization Tool by Ninjas. 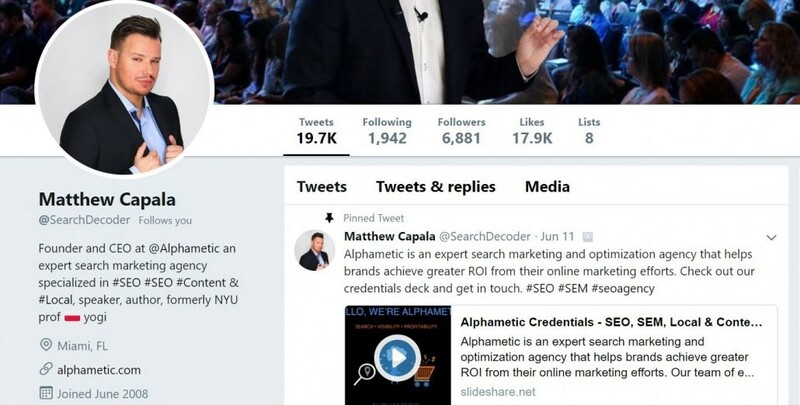 We didn’t include Matt in the original top 10 list because he’s the CEO of Alphametic, but he’s definitely a person to follow for updates on the going on’s in the SEO world. He has been in the industry for over 12 years, written an SEO guidebook called “SEO Like I’m 5” and taught digital marketing at NYU. He’s a regular speaker at SEO & digital marketing conferences and offers SEO training courses for small and large businesses. That’s all folks! This list is by no means complete, there are many SEO experts out there that are putting out great content, but we wanted to keep this list to 10 gurus to start building your resource list. 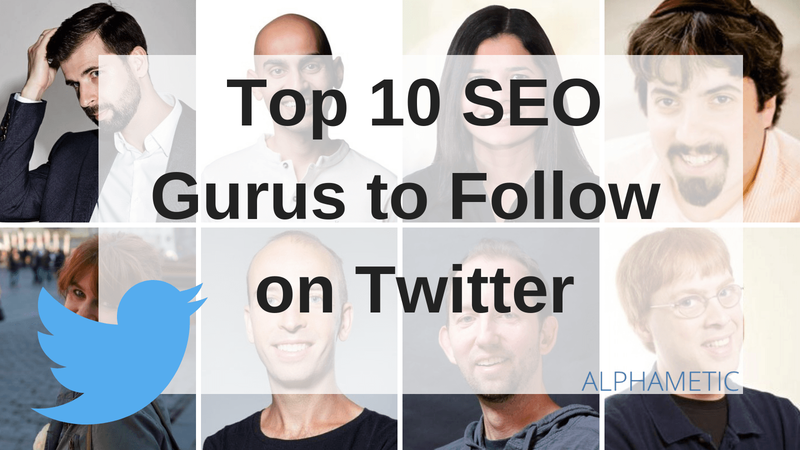 Alphametic has created a Twitter list called “Top SEO Gurus” which includes all these influencers. Follow @alphametic and subscribe to this list to get a curated feed of the best SEO content out there. If you have any suggestions for SEO gurus to add, tweet us your pick! For more curated lists, check out our 8 Digital Marketing Books to Read in 2018.